Trump's tweets have not yet been translated into a change in policy — the Department of Defense says it is "awaiting formal guidance from the White House." However, after the announcement the Pentagon did decide to defer the enlistment of new transgender members of the military until Jan. 1, 2018. Meanwhile, the trans service members suing the government — identified in their suit as Jane Does, out of fear of retribution — say that Trump's decision and proclamation have already been harmful. 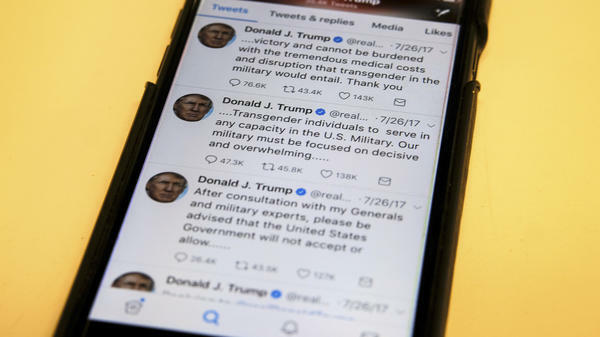 Trump's tweet came more than a year after the Pentagon announced that trans people could openly serve in the military, and would not be discharged on the basis of their gender identity. That announcement was in June 2016, after months of research and planning. "Since that time," the service members' lawsuit states, "Plaintiffs, along with thousands of servicemembers, have followed protocol in informing their chain of command that they are transgender. They did so in reliance on the United States' express promises that it would permit them to continue to serve their country openly." The five plaintiffs are in different branches of the military (the Coast Guard, the National Guard, the Army and the Air Force) and have collectively served for "decades," the suit says. Two were deployed overseas, in Afghanistan and Iraq. One plaintiff in the Army and the plaintiff in the Air Force have served for 17 years and "nearly 20 years," respectively. If enforced, the directive will end their service, they note. Even before it's enacted, the tweets have "resulted in immediate, concrete injury to Plaintiffs by unsettling and destabilizing plaintiffs' reasonable expectation of continued service," the plaintiffs allege. They're asking a court to provide injunctive relief, blocking the U.S. government from enforcing Trump's declared policy change. NPR's Greg Myre reports that there are several thousand transgender service members, according to estimates. The suit, filed by GLBTQ Legal Advocates and Defenders and the National Center for Lesbian Rights, identifies Trump as the defendant as well as the secretaries of Defense, Homeland Security, the Army and the Air Force, the Chairman of the Joint Chiefs of Staff, the departments of the Army, Air Force and Coast Guard, and the United States government as a whole. The Pentagon "had no immediate comment," The Associated Press reports.